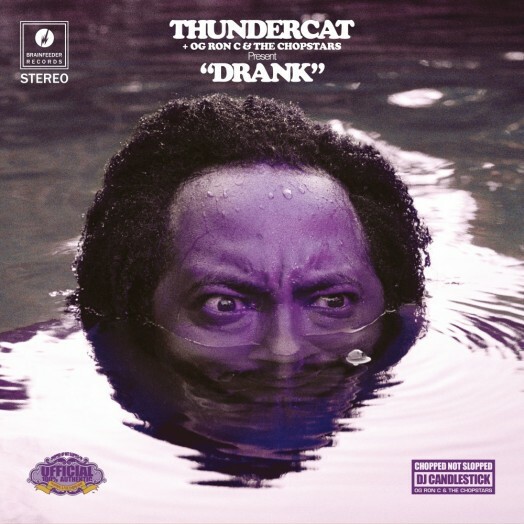 Brainfeeder presents a special “chopped not slopped” mix of Thundercat’s incredible album “Drunk” (2017) by DJ Candlestick and OG Ron C of legendary Houston DJ collective The Chopstars. Slowed down and chopped up, the mix has been fittingly re-titled “Drank”. It appeared online last year as an unofficial homage to the virtuoso bassist, songwriter and producer’s third and universally acclaimed album and received hearty approval from Thundercat, who proclaimed: “If you got ‘Drunk’ it’s only right that you get ‘Drank’. I feel like they go together.” – inciting Brainfeeder to make a vinyl format appropriately doused in purple. The Chopstars were established by OG Ron C, a veteran of southern rap who co-founded the illustrious Texas-based independent record label Swishahouse Records alongside Michael “5000” Watts in 1997, releasing records by Mike Jones, Paul Wall, Slim Thug and Chamillionaire. These albums would often be accompanied by mixes that were slowed down, scratched and juggled by DJs or “chopped and screwed” – a musical style originated and popularised by Houston’s DJ Screw (1971-2000). Paying homage to the legacy of DJ Screw, OG Ron C founded The Chopstars, recruited DJs Hollygrove, Slim K, Mike G (Odd Future) and Candlestick, and released remixed versions of hip-hop and R&B records by Drake, Kendrick Lamar, Lil’ Yachty and 2 Chainz, coining the terms “chopnotslop” and “chopped not slopped” – a reference to other DJs’ sloppily executed mixtapes. The collective have also famously chopped up Little Dragon’s “Nabuma Rubberband” (2015) and teamed up with Hollywood director Barry Jenkins to release a Chopnotslop version of the film soundtrack “Moonlight”.